89th – Look up at the trees, the branches laden with most fruits and leaves are humbly bent forward. I encountered Shivji in south Mumbai, one early morning on my ride; he was walking, not riding, his dilapidated bicycle, carrying a load of milk packets. I knew then and there, even from the fact he looked aged, I should stop and ask him if he would like a new lease of life for his Ferrari, his old vehicle of trade – his bicycle. I have preferred to do this, donation, for older people, as I feel it’s a kind of reward for them during their silver years, to receive a new Ferrari at nearly less than half its cost. Yes, their bicycle for them is nothing less than what the Ferrari means to Michael Schumacher! Shivji has been selling milk since 40 years. He is from Benares, UP. His father was a farmer. 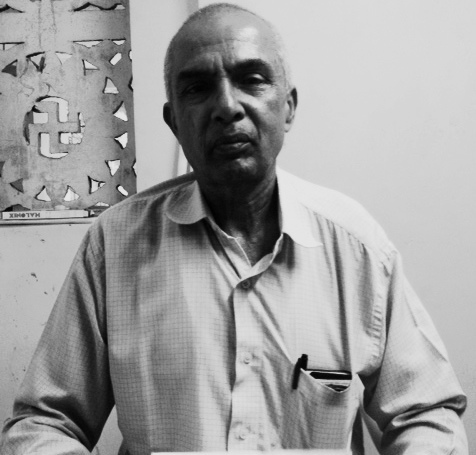 Shivji came to Bombay in 1970 looking for a job, because his familt’s financial condition was not good. He was studying in the second year of senior college when he was forced to leave his studies and migrate to Bombay to supplement the family’s agriculture income. His elder brother was a milkman in Bombay, and he was keen that he (Shivji) join the same profession, because he was established in it and had a good clientele. Shivji has two sons, and one daughter; his daughter and one son are married, and his other son has just graduated and is looking for a job. Wait till you read this :- Shivji had secured a job with the Indian Navy! Let me repeat this :- Shivji had secured a job with the Indian Navy! Yet, he became a milkman. Not that being a milkman means any less as a profession, because it’s as respectable, but I was very curious to know what changed his professional circumstances from that Navy job to one delivering milk. And as I probed, I found out it was ‘love’ that made him discard the great opportunity of the Indian Navy job and choose that of being a milkman. It was his elder brother’s love for him, and his love for his brother that was responsible for his choice and decision! When Shivji spoke to me about his elder brother, he joined his hands as though he was referring to a God! And soon his eyes even turned moist. So deep was this humble man’s love for his brother! I say humble, because to me Shivji came across as amongst the humble recipients I have met so far; he was calm and very dignified too. This kinship that author Khaled quotes, and even Shivji speaking fondly about his elder brother, reminded me of my own elder brother, Rajesh. The amount of tiny sacrifices he has made, all along, to help even me bloom into the fragrance I desire to be, collectively would amount to the greatest love of my life. God bless my brother. Yes. Live like that and the fruits of your labor will be yours too to have, I thought listening to this wonderful person I felt privileged helping, thanks to our donors. 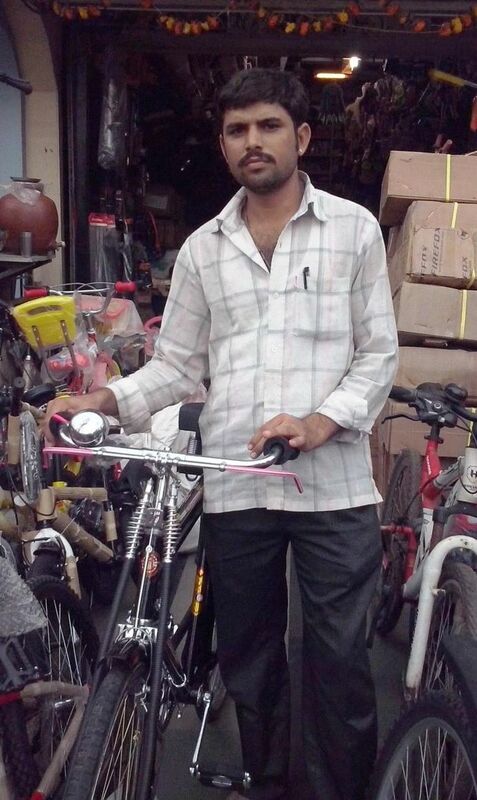 Gunjan messaged me a few weeks earlier, asking if he can donate a bicycle on the wonderful occasion of his son’s birthday, which is on 27th Oct.
Of course, he could, I assured him, since even my sister, Suman, had donated a wheelchair on her birthday earlier this year, and soon later a bike on the anniversary of her Mother in Law. It feels nice that some people want their special day to be special for someone else too; someone unknown to them, and someone they can never benefit from. That is true charity, too. We all wish Gunjan Shah’s son, Dhairya, (8) a very happy Birthday. Lots of hugs and love to little Dhairya. I wish when he is a little bigger he reads this post and realizes the significance of his father’s real gift to him in this bicycle. 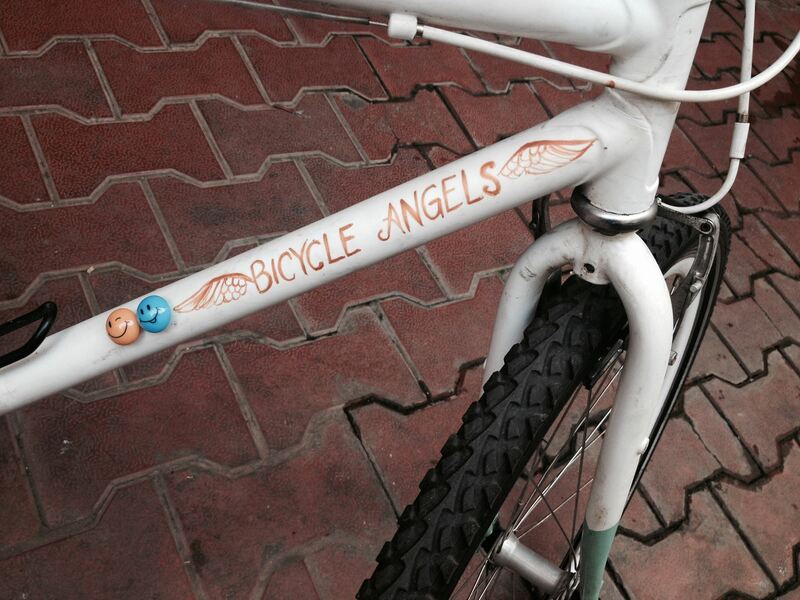 Bicycle Angels’s Idli Walas. A new initiative. Our new initiative! This Diwali. Happy Diwali. will feed 3 random and poor street people ‘idli sambhar chatni’ every day. One plate costs rs 10. 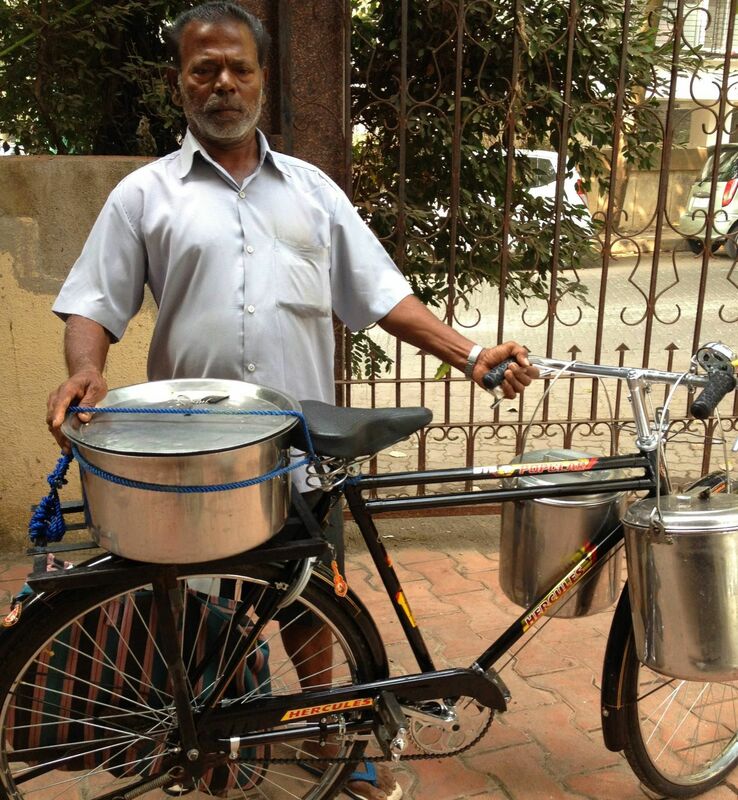 Mani sells idlis in bandra from his bicycle daily from 7 am to 11 am. He will feed the needy during his regular work hours and regular route, so no extra effort on his part, and he too will earn his living as he cooks these himself. 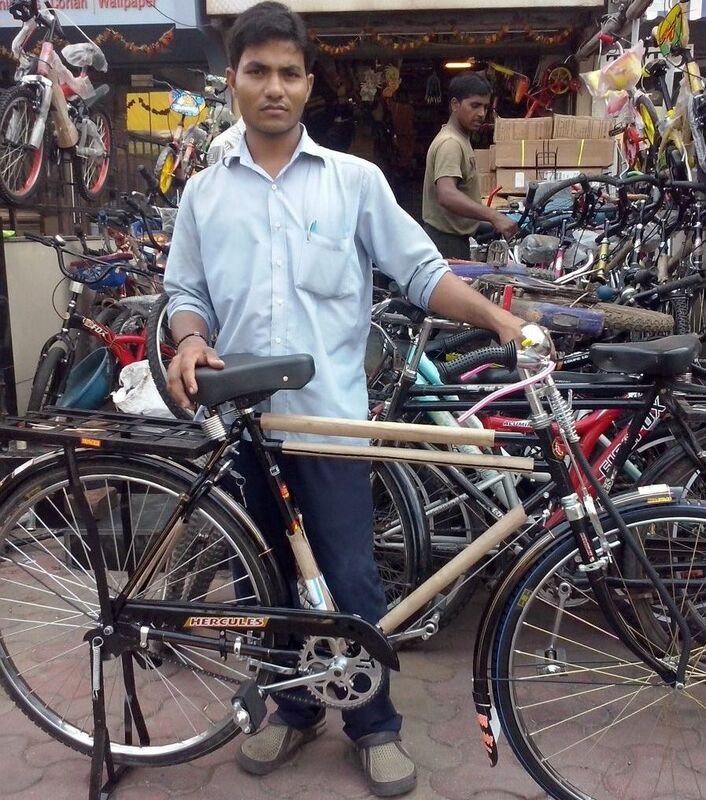 This concept to increase the natural embrace of Bicycle Angels arrived to me thanks to my dear friend Siddhi. It was her passion to feed the poor, daily, that fired and motivated this non profit service. Love. 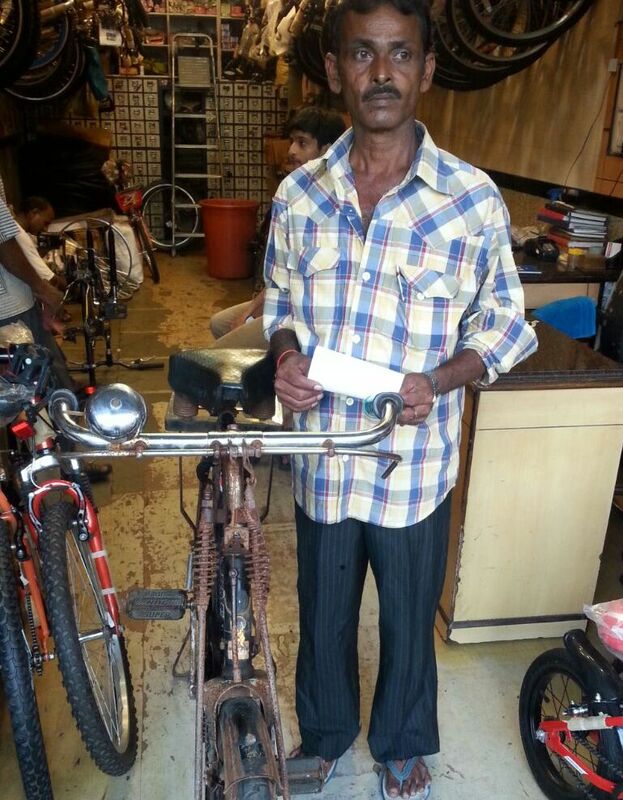 88th recipient – Our fathers, the first ‘Superman’ of our childhood. I will not stand in judgment on that. But, well, speaking of chance, education and livelihoods: “Far and away the best prize that life has to offer is the chance to work hard at work worth doing.” – Theodore Roosevelt. 87th recipient – Prayer is but a longing of the soul. 86th recipient- Rather beg than steal. He himself is educated up to the 5th Std. His parents could not afford to educate him beyond the 5th. More than their financial condition, his mother was seriously unwell for a long period, and there being no one at home to look after her, his father told him to stay home to look after his mother, and therefore he could not attend school thereafter. His eyes glazed a bit when he spoke of his mother. He got his bike, and in return I got to know that some amount of happiness has already courted him, it’s just that he does not know it as yet – The blessing of having obedient and honest children.